Athena complained rubbing her stomach as we left the store. I feel the same. The Flying Spaghetti Master's menma is great, but eating too much of it has given me heartburn. I felt that too. He seemed to become unnaturally fidgety when I brought up the topic of Mr. Goodwin. Was there some kind of trouble between Ramon and Mr. Goodwin? I'll need to uncover the details. I'd drawn a map with the address. I opened my bag to pull out the piece of paper out when something occurred. I heard a lively voice. There were three young boys with backpacks talking as they walked. They were probably in... third or fourth grade. The boy in the middle was talking with great excitement. The other two boys responded. The boy noticed us in front of the store and stopped talking to smile at us. The boy gave us a wink. It was practised like a pop idol's wink. His two friends said “Bye, Armen” and “See ya tomorrow” as they walked away while waving. Armen opened the door to the shop with vigour and called out “I'm back~” as he went inside. Athena whispered to me after the door closed. We left the store and and followed the map I had drawn. The wind was strong as always. I hate to say it, but 'The Flying Spaghetti Master' didn't really look like it was that popular. That it made enough to buy a plane was beyond my expectations. Athena seemed to have the same opinion. Athena held her hands together with a big smile. Come to think of it, there were a lot of pictures of aircraft inside the shop. I suppose he's an aviation maniac through and through. I mean, he even called the shop 'The Flying Spaghetti Master'. Anyway, our next destination was Mr. Goodwin's office. I looked at the sheet of paper with the map to check the location one more time. A particularly fierce gust of wind took the paper from my hands. The paper fluttered in the wind. Athena and I chased it in a panic. Suddenly, the paper vanished from view. The paper had been caught by a thin old man. He gripped a butterfly net with both hands. He swung his katana... 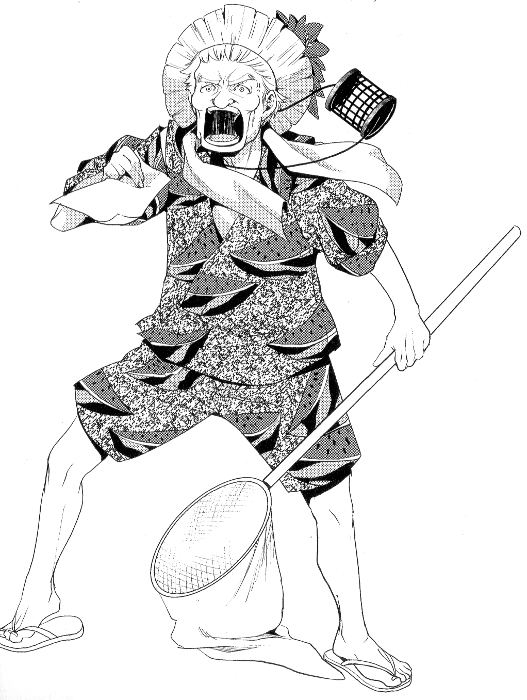 I mean, butterfly net, as if he were a samurai in a period drama, splendidly catching the paper. The old man slowly lifted the net from the ground and removed the sheet of paper from it. We ran over to thank him. The old man suddenly let out a strange yell. Athena and I were taken aback. The old man swung his butterfly net with a dangerous look in his eye. Despite the fact that a net is unlikely to give you lasting injuries even if you are hit with it... his intensity was intimidating. It wasn't on purpose, but I can't deny that it was my fault. I lowered my head in apology. – However, the absolutely fearless Athena spoke up with a bright curiosity on her face. That fierce noise once again. We were taken aback. The old man thrust the paper back at me. But before I could confirm it with him, the old man noticed something. He saw the address I had written down. This is a huge misunderstanding. But we've finally found someone willing to talk about Mr. Goodwin. And one who completely turns his good image on its head. This is potentially controversial testimony. It could be really helpful to our case. The old man gave me a sharp glare as I made my enquiry. Suddenly a loud voice echoed and the old man cut himself off. It was Ramon Berger. He was out of breath having run all the way here. Ramon grabbed his grandfather's hand and bowed his head to us. Ramon pulled his grandfather along by the hand. Alden was oddly compliant with his grandson's actions. Athena lamented as she watched the two of them depart. That's right, Armen had mentioned his grandpa's plane. Which means that Alden has his own personal aircraft. I held on to the paper tight to make sure we didn't lose it a second time as we went to Goodwin's office. Mr. Goodwin's office was on the main street not far from the station. It was the heart of this city. The building his office was in was old fashioned and made of stone. The elevator was also old style. Athena murmured. It wasn't what I was expecting either. He'd been a politician for many years, I was expecting something a little more grandiose. When I knocked the door the response “Come in.” came from inside. I opened the door. The room wasn't particularly vast and there were desks and cabinets lined up neatly. Beyond that was a simple lounge suite. There was a single man in the room. He was sat at a desk doing some kind of work, but stood up when he saw us. 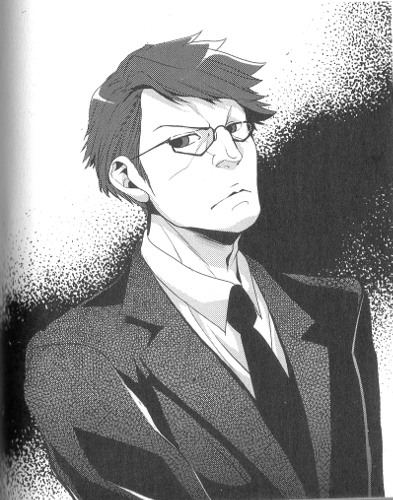 He was wearing a sharp looking suit and metal framed glasses. His age was probably somewhere around 30. He seemed like a highly capable intellectual. The man nodded and offered his business card. Mr. Secker guided us to the sofa. As he served us tea, I nonchalantly surveyed the office. The desks and cabinets were incredibly tidy. It's a far cry from out office which has stuff all over the place, magic props, a piano, fake food, etcetera. On the wall was one of Mr. Goodwin's posters and a schedule. Most of the schedule was packed to the brim, but the rest was all blank after the words 'Business Trip' written for yesterday. The photo on the poster showed him in the peak of health. He was apparently 67 when he died, but he looks a lot younger. The slogan 'Bringing a dazzling white shine to all!' was written beneath his smiling face. Athena whispered. She only meant for me to hear, but unfortunately Mr. Secker overheard her as he brought the tea. Mr. Secker spoke with a smile as Athena blushed in embarrassment. Mr. Secker lowered his head in a deep nod in response to me. I shot straight on the offensive. Mr. Secker made a doubtful enquiry. I naturally didn't want to give away his name, but Mr. Secker seemed to clue in immediately. Best friends...? That's not the impression I got. Mr. Secker looked straight at me. Athena burst out unable to contain herself, but I stopped her. At this point, there was no denying that Apollo was the prime suspect. Nothing we say here will clear his suspicion. This isn't the place to prove Apollo's innocence. The courtroom is. Mr. Secker spoke with a polite smile. His phrasing was polite, but it was clear that 'I'm busy, so get lost.' was the true meaning behind his words. As expected of a politician's secretary, he was quite good at conveying his intent without any words... I felt an odd kind of admiration for this skill. I signalled Athena with my eyes to keep her from saying anything and bowed. In the end, we got nothing of any use in the vicinity of Seafield Airport. Though a number of things still bug me. Mr. Goodwin's reputation is unnaturally clean. Yet nobody was willing to say anything about his death. The only person who seems to know about Mr. Goodwin's dark side is Alden. And perhaps Edgeworth, based on his attitude. This case seems like it's going to be complicated.